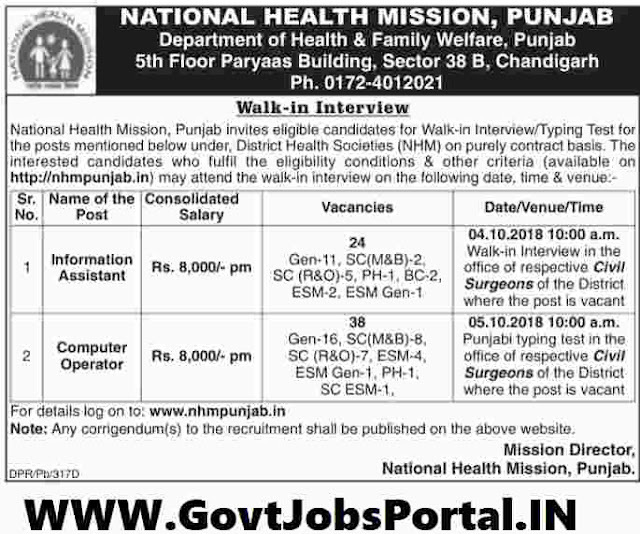 Date/Venue/Time: 04.10.2018 10:00 a.m. Walk-in Interview in the office of respective Civil Surgeons of the District where the post is vacant. Date/Venue/Time: 05.10.2018 10:00 a.m. Punjabi typing test in the office of respective Civil Surgeons of the District where the post is vacant. IMPORTANT NOTE: Education and Age CRITERIA Detail has been not published in the News Paper Notice which we shared below, When the complete notification is out on the official website we will let you know about it OVER HERE. As we also check the official website there is no official notification yet on 25th Oct. 2018 related to this notification. Department will soon published the full detailed notification on the official website. 4TH, 5TH Oct. 2018 is the Interview Dates.